The cycling season in Russia is mainly May to September. The most popular areas for this type of ecotourism are Altai, the Kola Peninsula, Lake Baikal, the Urals, the Golden Ring and Karelia. Russia, with its northern climate, uneven terrain, rough roads and temperamental drivers, is perhaps not the best country for the amateur cyclist. Thus, bike tours in Russia are a fairly new concept. However, the idea is catching on among Russian travellers and foreigners alike. The variety of the topography, climate and landscape in Russia caters to all requirements, be it extreme BMX in the Khibiny Mountains, family trips around the Golden Ring, biking and kayaking in the Trans-Baikal region, or descending the mountain rivers of Kamchatka. The Altai Mountains are known for their steep slopes, impassable taiga and innumerable alpine lakes and rivers. The slopes and lowlands are full of archaeological sites that date back thousands of years. It is here that countless travellers seek out the legendary land of Shambhala, while Old Believer villages coexist with settlements of nomadic pagans. 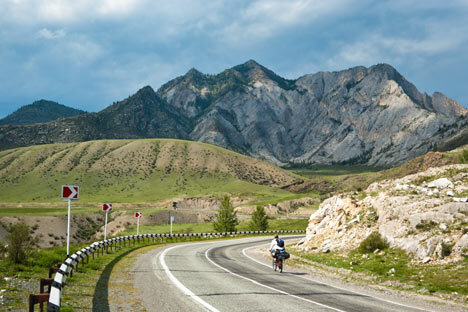 Altai bike tours are usually combined with horse riding, mountain rafting and off-roading. Cycle trails inside the Arctic Circle are usually no harder than in other regions. Groups of five to 12 cyclists cover some 50 kilometres a day, travelling through the gentle terrain of the Khibiny Mountains. Nearly the entire territory of the Kola Peninsula is situated inside the Arctic Circle, in the tundra zone. Here, the sun does not sink below the horizon from June to August. The nomadic Sami – the indigenous people – scour the peninsula in search of reindeer moss, make traditional Lappish reindeer soup and tell fortunes in drawings of the Aurora Borealis. Travel agencies in Karelia organize bike tours around Lake Ladoga and the Karelian Isthmus, providing an opportunity to explore the island’s nature park, the Valaam Monastery and the hermitage sketes, as well as the nooks and crannies rarely seen by tourists. Bike tours are usually combined with boat trips. Karelia also offers popular one- and two-day excursions to Kivach – the second largest flatland waterfall in Europe. Cycle tours here usually take place in Bashkiria, which enjoys one of the most favourable climates in the region. Tours are usually combined with a day's rafting on catamarans. The Urals offers all kinds of active tourism: horse riding, catamaraning, kayaking, cycling and hiking in the mountains and flatlands. The Urals are the oldest mountain range in Russia. They are not high, but rocky. The most common landscape features are taiga forest, alpine meadows and tundra. The Southern Urals steppe is home to the famous and ancient Arkaim, also known as the "City of the Sun." Every year, thousands of tourists from all corners of the globe come to see the settlement excavations, which, according to archaeologists, date back to the second and third centuries B.C. Lake Baikal is the deepest and one of the oldest lakes in the world. It is known worldwide for the purity of its water and its unique microclimate. Here, taiga rubs shoulders with semi-desert, and tundra with steppe. The lay of the land along the Baikal shoreline offers a huge variety of bike trails. For cyclists, this could well be the most interesting region in all of Russia: The high banks open up beautiful vistas of the sea-size lake, and the locality is dotted with small salt lakes, forsaken in the vast tundra and steppe. Most of the bike trails end in the middle of Lake Baikal, at the legendary Olkhon Island – pristine and untouched. One of the most rewarding experiences in European Russia is a bike tour of the Golden Ring – a famous tourist route that runs through the towns of Old Rus, which have preserved some unique monuments of early Russian history and culture. Tourists visit Vladimir, Suzdal, Rostov, Ples, Kostroma, Yaroslavl and Uglich. Although there are other options – bus tour, train, car – many people prefer to complete the route by bicycle. The route, which runs between 597 and 698 kilometres, can usually be covered in 11 days.